I regularly take the Lyon street lane, “protected” by intermittent floppy plastic bollards, on my way home. Two weeks ago I was knocked from that lane onto the sidewalk by an SUV making a right turn from Lyon to Gladstone. After completing the turn the driver paused a good distance away after hearing me bang against the vehicle, and as I got up with the help of another cyclists the vehicle simply drove off. Why wait around after hitting a cyclist in front of a witness? When asked why I didn’t report that collision I explained that it seemed entirely unremarkable, given the constant threat of being doored or driven into at almost any point on my commute. At today’s impromptu rally I was pleased to hear Councillor Jeff Leiper describe his commute from Westboro to City Hall in similarly hair-raising terms. I’m also heartened to see Leiper’s maps and videos documenting that commute, and to hear his neighbouring councillor Catherine McKenney explain how she commutes along that route, and how she wouldn’t let her nine-year-old cycle there. A wise man said a century ago that “the bicycle is perhaps the best road inspector there is.” As a safe streets advocate I put a lot of faith in my own cycling experience, and in that of city officials who commute by bike. Whereas I bounced off the side of the rightward-turning SUV at Lyon and Gladstone, Nusrat Jahan went under the wheels of a large construction truck with no sideguard protection. Upon hearing the heartbreaking news my mind went immediately to cyclist Meg Dussault, who was killed by a similar truck three years ago at an intersection that I go by an average 2-3 times a day. Ottawa city officials have enacted legislation removing the embarrassment of ghost bikes, and they quickly removed a life-sized image of a ghost bike painted at Meg’s kill site. It’s all a distraction for drivers, they say. Yet they’re in no hurry to fix the deadly infrastructure, probably made more deadly by the ridiculous sharrows. Meg’s memory, and the risk of the site, is preserved in the form of chalk bikes that keep getting carefully washed away and redrawn. This evening a second chalk ghost bike appeared alongside Meg’s. Whatever happened to Nusrat Jahan, there are doubtless all kinds of safeguards—island-protected “Dutch junctions“; bans on large trucks at certain hours; modal separation at intersections via signalization; sideguard legislation—that could have saved her life. Any such progress requires political will, and on that front I’m happy to report that we made some notable progress today. Here’s how it went down. This was a bold move, and it worked at the speed of social media. What felt like well over a hundred people had shown up by noon. At the time none of us knew the identity of the victim, and frankly it was immaterial. We were there in solidarity with her, her friends and her family, whoever she may have been. Scores of citizens including three councillors were united in grief, and in anger about the senseless carnage on our streets. Crucially—and I’ve emphasized the importance of this in my description of the recent Toronto Miracle—the press also showed up, and they set to work in the most impressive way. You can get a good sense of the resulting media scrum in the video accompanying this excellent Ottawa Citizen report. It opens with Coun. McKenney calling for a Vision Zero commitment. Most people still don’t know what that means, but these people seemed very tuned in. 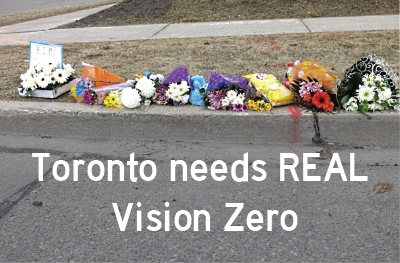 "#VisionZero on our streets in this city." It's time says #Ottawa Coun. @cmckenney. Here’s the Metro Ottawa report that came out an hour after the rally. 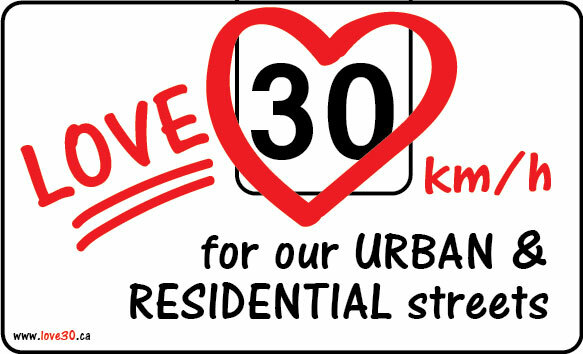 @BellevilleDrive @DTBelleville @BellevilleON @Love30ca Stumbled on this image of VZC stickers in the local newspaper. I handed out a few at a September #ottbike rally. The local CBC updated a report over the course of the day, and revealed the victim’s identity. Just as we had suspected. A beloved daughter and sister. A human being full of life and potential.